We were thrilled to retain the prestigious accolade of Recruitment Company of the Year last night at the Talk of Manchester Awards, held at the Mercure Manchester Hotel. Finegreen at the Talk of Manchester Awards 2016 tonight! Some of the Finegreen team are at the Mercure Manchester Hotel in London tonight, attending theTalk of Manchester Awards 2016 where we are shortlisted as a finalist for Recruitment Agency of the Year, an award we are hoping to retain! 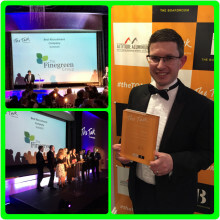 Finegreen at the Talk of Manchester Business Awards 2015 tonight! 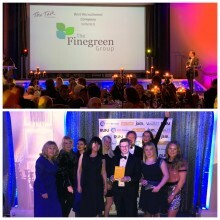 The Finegreen Team are looking forward to attending the Talk of Manchester Business Awards at the Mercure hotel tonight, where we're shortlisted for Best Recruitment Agency. Finegreen sponsoring the Future of Hospitals Conference and Exhibition this Tuesday! The Finegreen team are looking forward to exhibiting and co-sponsoring the Future of Hospitals Conference and Exhibition, taking place this Tuesday 1st December at the AJ Cross Stadium in Manchester. The Conference will address how existing innovative, patient-centred services are working to develop a comprehensive model of hospital care that meets the needs of patients, now and in the future.